It's official, the people of Sheffield absolutely love a good Hog Roast!! We know this from experience, with our Sheffield Hog Roast Catering team having provided the very best free range hog roast, pulled pork and BBQ catering services in the area for a number of years. Whether you require indoor or outdoor catering for any type of event including Weddings, Street Parties or Birthday - we are here to serve top quality Hog Roasts to Sheffield and South Yorkshire. Our meat is always ethical and free range, and all our other produce and ingredients are all fresh local and prepared by our family run Yorkshire caterers completely by hand. Our Sheffield Hog Roast Caterers are of the opinion that the very best ingredients allow our chefs to make the most delicious food - which is why our Yorkshire catering team always make sure to work in this manner. All our meat is sourced locally to Sheffield from the highest quality livestock that have been reared with great care and responsibility for our BBQ and Hog Roast menus. Using the very best local Sheffield ingredients and meat has also meant we are now recognised across Britain, winning many national food awards. If you hire a Hog Roast for your Sheffield event you will ensure that all your event guests get hot, wholesome and convenient food that is cost-effective. 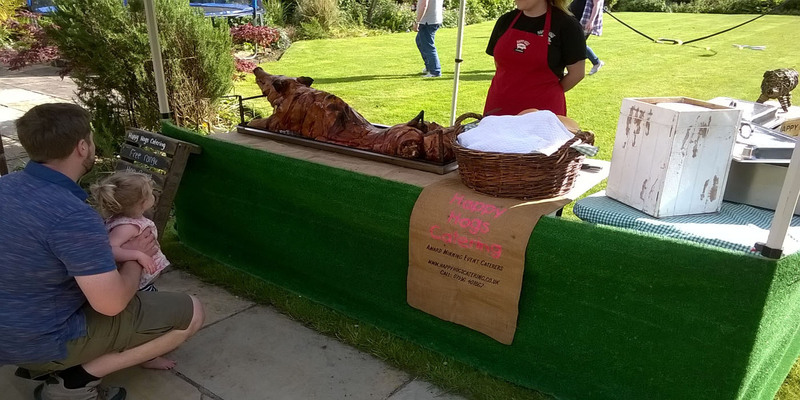 We have professional and experienced Sheffield Hog Roast Caterers that have served good food at hundreds of events, so we know first hand what a spectacle and good impression barbecue catering leaves with guests at a gathering. If we look at the Hog Roast for example, this is a magnificent centre-piece which never fails to draw a group of spectators. We pack fresh home-made fillings, meats and dressings into a simple bread roll or bap to create a mouthwatering and extremely satisfying meal. With Hog Roast Catering in Sheffield becoming more and more popular, the demand has steadily increased over the years for a really good Hog Roast or BBQ catering food. Birthday gatherings, family parties and business events are all suitable situations for our wholesome Hog Roasts. But why is Sheffield Hog Roast catering so popular at present? We can only speculate that part of the Hog Roast's success has been due to Sheffield's historic background, culturally being more suited to a tasty and rustic Hog Roast catering style which parallels Sheffield's nostalgic and rural surroundings. Businesses in Sheffield have also now caught on to the Hog Roast's unique charm, with our caterers providing business catering and food for events, corporate showcases, product launches or open days. Hog Roast Wedding Catering is extremely popular too. Our catering staff provide wedding catering throughout the year as well as also serving at Seasonal holiday events such as Bonfire Night, Christmas parties, New Year and Halloween parties. Sheffield Hog Roast catering is perfect for any time of the day and any season of the year! We don't just provide Hog Roasts for Wedding Catering; we are experts at it! Yorkshire Hog Roast Catering serve at least 150 weddings each year, at which we supply our well-trained chefs who have acquired through experience a wealth of knowledge and understanding of what makes the very best Wedding Catering experience. Sheffield Hog Roasts and Barbecue wedding catering always receives a tremendously positive reaction with guests, family and organisers - it never fails to make an event more memorable and a fun experience as well as a catering talking point. Our Sheffield Catering staff only use free range produce to put together catering menus and packages, with Hog Roasts and Barbecue food always cooked to perfection. We allow you to customise and amend our Menus in order to suit your needs and guest's requirements whatever the event or occasion. To book your Sheffield Hog Roast catering or BBQ food for a party, wedding day or any other event then please contact our Hog Roast catering team. Why Choose Hog Roast Catering in Sheffield? Maybe you have overlooked the idea of Hog Roast Catering in Sheffield before, but it really is the best choice for a number of reasons. With a Hog Roast, the meat can be carved freshly cooked and served hot and mobile - indoor, outdoor, seated or standing! Sheffield-folk love it! So whatever the situation your guests can eat perfectly cooked food. Not only this but there is always that gorgeous pulled-pork and barbecue taste to a tender and slow cooked Hog Roast. If you opt for Wedding catering, the Hog Roast can even be set-up and served from inside, Hog Roast catering in Sheffield is no ways about it the very best type of catering around. The food also makes an occasion more exciting, especially if it is as tasty as ours. Our Hog Roast caterers will always aim to please your guests attending a Sheffield-based event and we can guarantee they will leave remembering and harking back to some of the very best food they have ever tasted! Sheffield Hog Roast Catering are pleased to have now won ‘The North of England’s Wedding Awards’ in the caterers category, going up against Exclusive Caterers Dine previously from Sarah Beeny’s wedding venue Rise Hall and Michelin star dining from Box Tree Catering previously owned by James Martin celebrity TV chef and many other event caterers, wedding caterers and Yorkshire caterers.